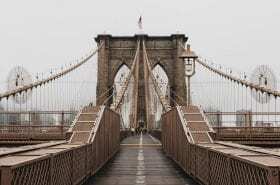 New York City is a hub for foodies and connoisseurs alike; I would move to New York for the food alone. The day after our trip to Staten Island, my friends wanted to return for a visit to the Staten Island Mall. In the morning, we took a walking tour with the 9/11 Tribute Center (through our CityPass of course). The tour was incredibly sobering; although we didn’t visit the memorial museum, I am extremely grateful we had the opportunity to hear about 9/11 through the eyes of New Yorkers. After the tour, my friends and I parted ways for the day. 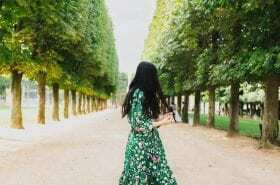 Personally, I like spending time alone in a large city (I also did this in Amsterdam), and my friends were able to shop for as long as they wanted! Soho tops my list of my favorite New York neighborhoods, so obviously I had to go back one last time. I revisited the Glossier penthouse for some extra goodies to take home for my sister, and stumbled upon a storefront for one of my favorite brands, Apolis. As a souvenir for myself, I bought an Apolis market bag with “Brooklyn, NY” stamped on the front. (I plan on showing this bag off in another post soon!). Despite my seemingly endless shopping, I spent most of the day eating some of the best food in the city! 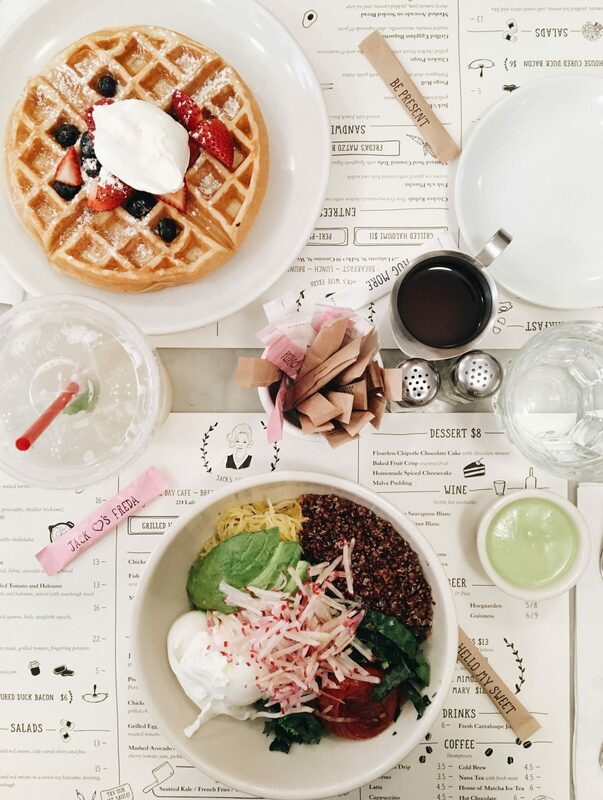 I thought I would create a roundup of where to eat in NYC, for every type of foodie! The Consensus: I had been waiting for years to try this infamous brunch spot. Their picturesque tabletops and colorful foods have graced my Instagram feed for as long as I can remember. Upon arriving, I had no idea what I was going to order; the excitement was too real! Luckily, a couple of girls eating at an outside table had just received their food, and seeing their breakfast bowls helped make my decision. I usually prefer sweeter dishes, so picking a savory dish was quite different for me! The rosewater waffle was light and airy, the yogurt adding a punch of creaminess and the berries a little tartness. To top it off, the mint lemonade was perfectly refreshing. Jack’s Wife Freda exceeded every expectation I could have had, and more. The Consensus: The location we ended up at was absolutely stunning, set inside an old church on the Upper East Side. We both ordered the same toast, but with two different sets of toppings. The toast was great for a light meal, I’d love to try one of the more filling options one day. 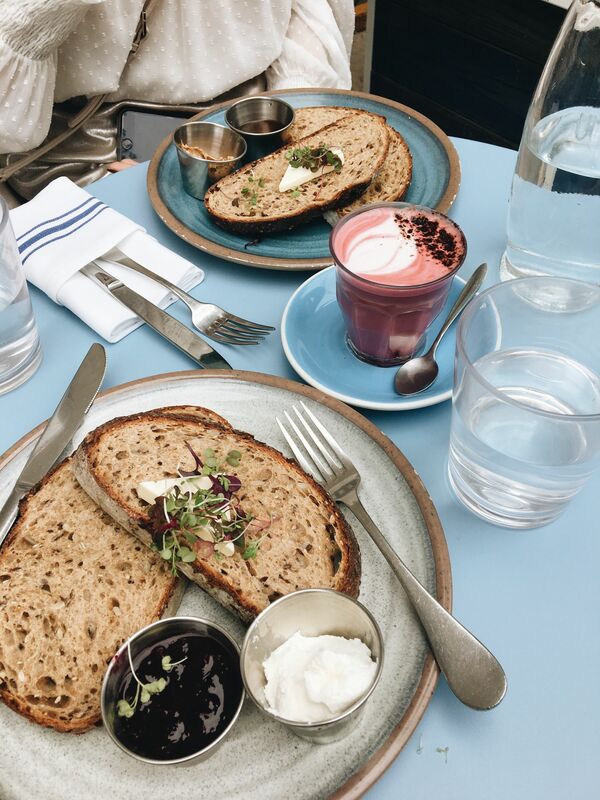 We could only describe the beetroot latte as “earthy” (in a good way), but the color is beautiful so we got past it. This place is great for a light brunch and coffee. 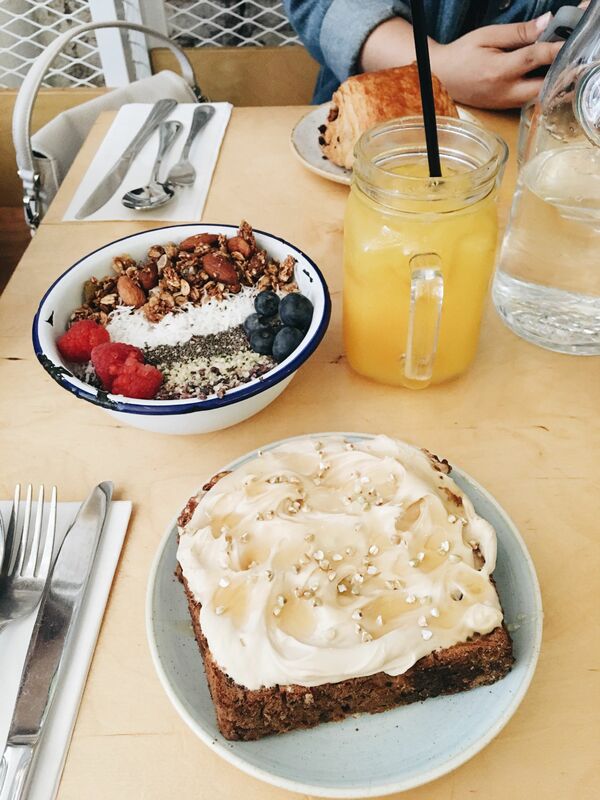 The Consensus: Considering its gluten free, the banana bread is a great choice for gluten-intolerant eaters. Fresh squeezed orange juice is always the best choice for breakfast. The acai bowl, although it didn’t top our West Coast Banzai Bowls, was still pretty tasty and didn’t feel heavy like the dense banana bread. The espresso mascarpone satisfied my sweet tooth without being too sugary. It’s actually a fairly small space, so larger groups may have to wait longer; small brunch spots are all the rage in New York, I guess. I’ve also heard that the avocado toast is quite popular! 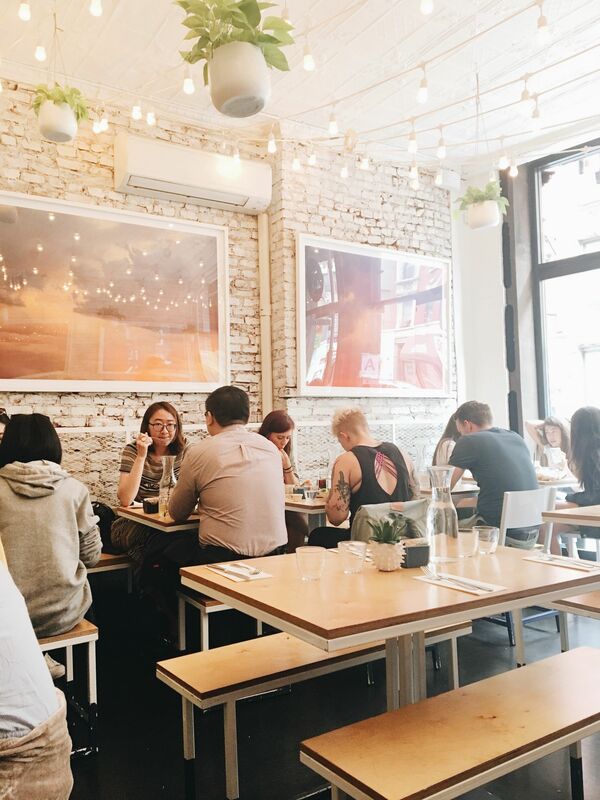 The Consensus: Most of the brunch places on this list are great for a light meal or a (semi)healthy option, but Egg Shop is one of those indulgent restaurants where your heart and your stomach feel happy. I ate here alone, which ended up working out because the shop is quite small (not really any room for groups larger than 4). The bartender and I made great conversation and he was super helpful with his recommendations. The Eggshop B.E.C. was definitely one of the best sandwiches I have ever had. The broke yolk oozed out of the it, and although I don’t like bacon, every part of the sandwich complemented one another. Extremely satisfying, would recommend everyone visit at least once! The Consensus: Despite swearing off of dairy (mostly just ice cream and cow milk-heavy foods), I would order this ice cream over and over and over again. The matcha flavor doesn’t feel heavy at all, and the black sesame brings an earthy tone; they combine perfectly. The taiyaki cone was just as tasty as it was pretty! 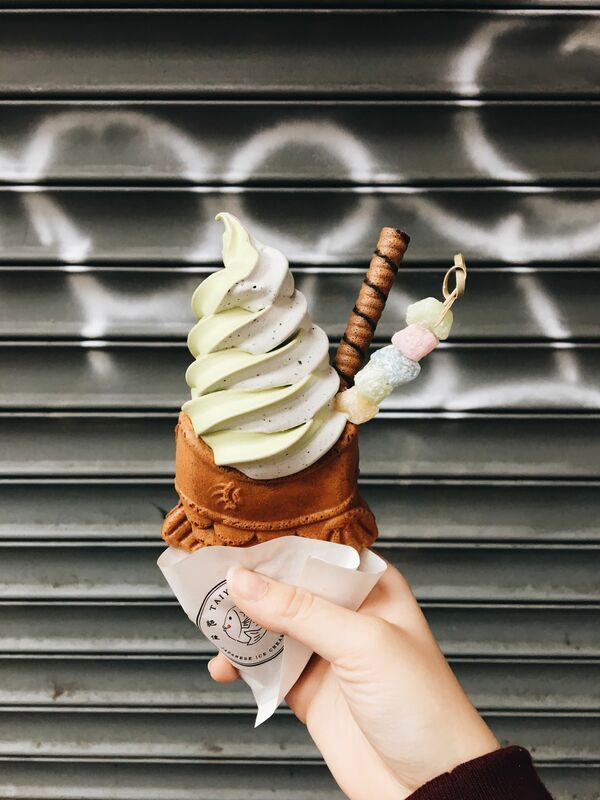 The tail of the cone is filled with a red bean filling that makes that last bite just as delicious as the first. Definitely favorite dessert from the whole trip! The Consensus: While I waited for my friends to arrive, I sat outside the shop talking to passersby and customers who sat by me after ordering their cookie dough. Every person I encountered fretted about how dense the dough was; most people could barely get past one scoop. I took their advice to heart and stuck with one scoop in a cone, but they still packed it in (which was nice!). The first couple of bites are, of course, scrumptious in every way, but the further you get, the harder it is to finish. Personally, I would split one scoop between a group, and coming from me (who finishes desserts like it’s her job), that’s saying a lot. Be sure to get in line at a good time! The line can be up to 3 hours long, so go before the late evening or earlier in the day! The Consensus: Ample Hills had been on my radar since seeing it appear on a list of the best ice cream in each state. After a (long) day during our trip, we needed some ice cream as a morale boost. Long story short, we ended up sprinting to a little Ample Hills Creamery stand in Brooklyn Bridge Park, arriving the minute they were supposed to close. The staff workers were so kind to us and served us as their last customers of the day. The Munchies is a very unconventional flavor, combining sweet and salty all in one. The pretzel cone was the perfect amount of crunch in addition to the creaminess of the ice cream. Ample Hills also told us they were awarded best ice cream in the nation, and it very much lives up to its reputation. The Consensus: I’m a West Coast Best Coast girl at heart, but Shake Shack wins my heart over In-N-Out any day. My first Shackburger was on their terrace in Madison Square Park, and I ordered a double because I was starving. The burger melts in your mouth, and isn’t overly chewy. In my opinion, it’s the perfect burger. My friends ordered the Chick’n Shack, which is great for people who don’t do red meat, and they sung praises over the red velvet shake (they ordered it every time). At every opportunity, I would eat at Shake Shack, even eating my last Shackburger in the airport by my gate! 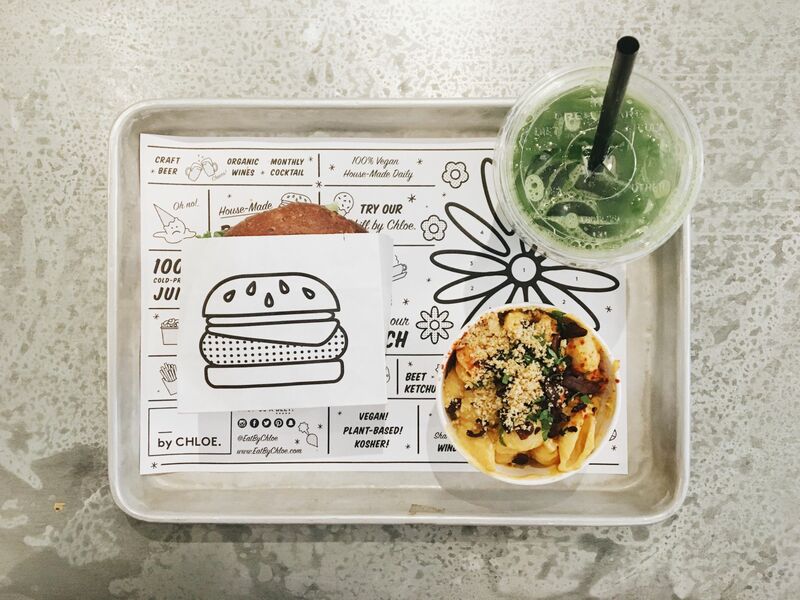 The Consensus: If you’re vegan, this place is perfect for you. Actually, even if you aren’t vegan, this place is perfect for you. 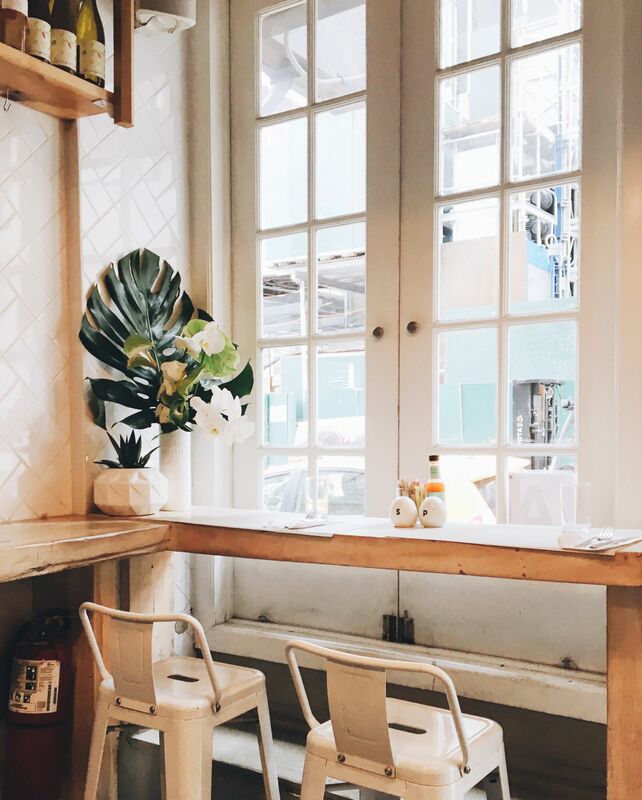 This brunch spot is a favorite among bloggers during Fashion Week, and I can totally see why. The guac burger was bursting with flavor, and knowing that it was all plant-based didn’t make me feel guilty in eating it! The mac n’ cheese was rich without the dairy (my dream come true) and the matcha was the perfect light drink for my meal. I have also heard that the fries are delicious as well, but mac n’ cheese is my weakness. There are also shoot-offs of By CHLOE., Chill By CHLOE. and Sweets By CHLOE., an ice cream line and a bakery respectively. A plus, they are all vegan! Chelsea Market sits along the High Line. It’s not only a shopping faire, but also a food court! We ordered pizza (fairly cheap for the amazing quality), but I could’ve eaten at many of the restaurants that were inside. 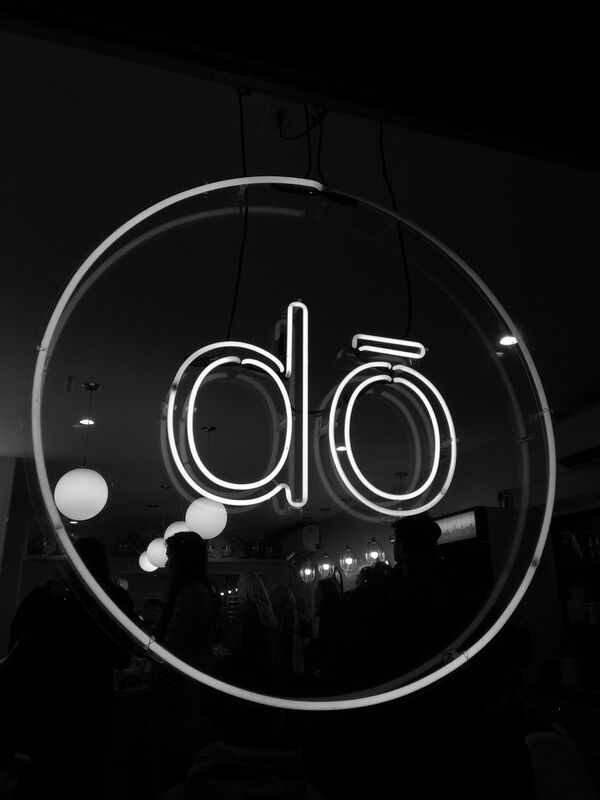 A ramen place, a coffee place, crepes, doughnuts, the list goes on! 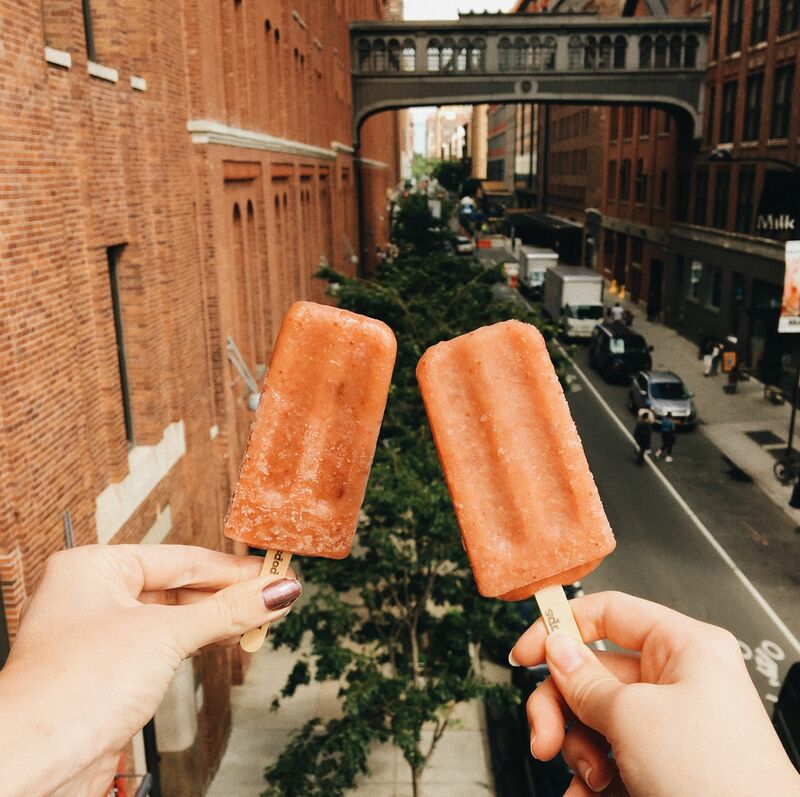 For dessert, we ordered strawberry rhubarb pops on the High Line to beat the heat. There is also a slew of restaurants, big and small, lining the streets in Chelsea. Another great food court: Brookfield Place nestled underneath the Oculus. The only true difference between Chelsea Market and Brookfield Place is the view. The seating in Brookfield Place overlooks the city skyline and the glorious waterfront. We visited on a cloudier day, but from what we could see, it was beautiful. I’ve said it once and I’ll say it again, I would move to New York just for the food. There truly is something for everyone. 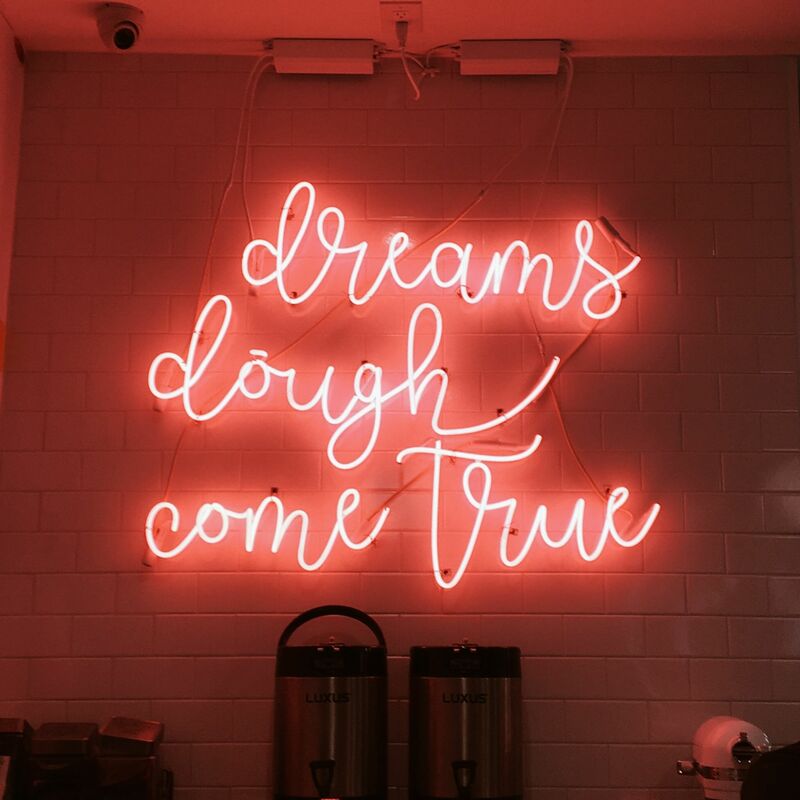 If you have any recommendations for where to eat in NYC, I’d love to hear about them for my next trip!